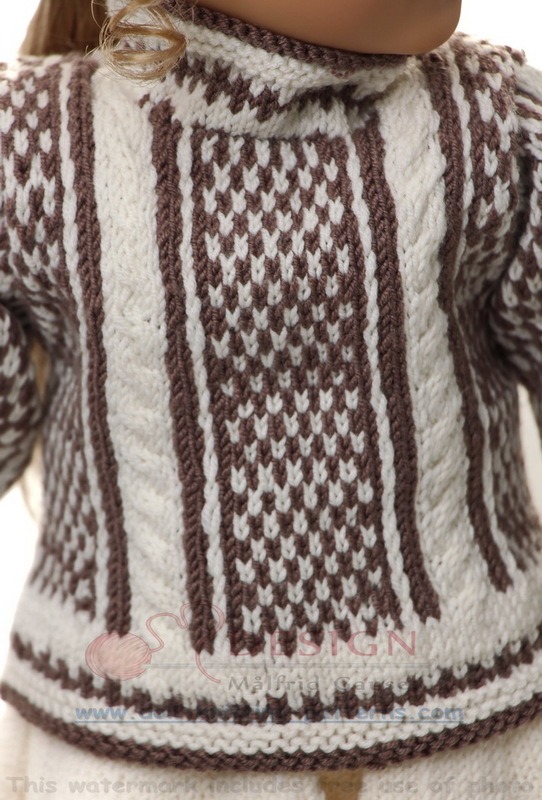 This time the clothes are knitted in off-white and brown. 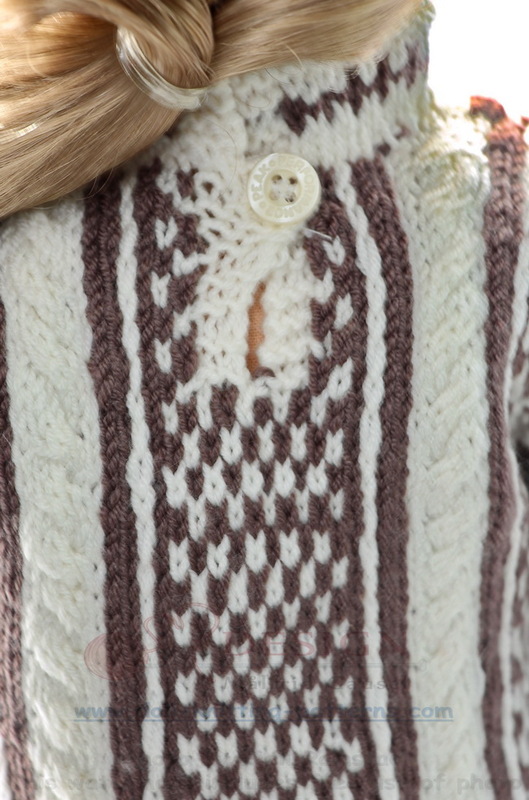 The sweater has lovely cables in off-white along the front and back. 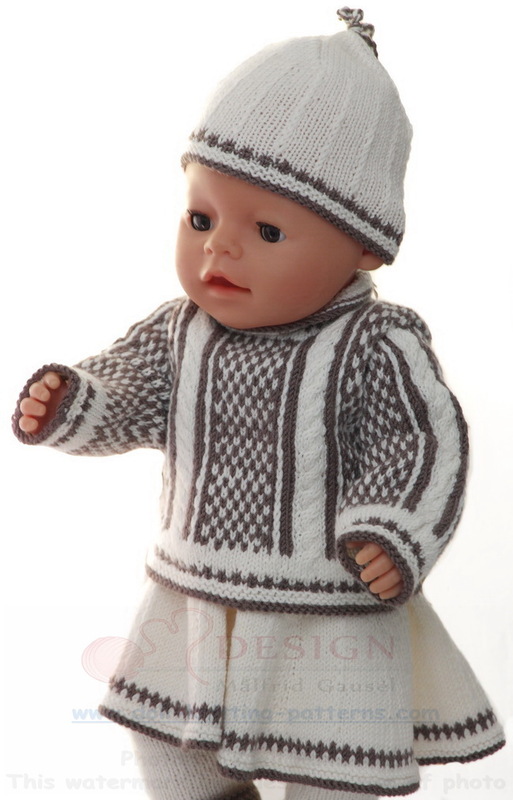 When knitting a new garment for a doll, I sometimes look for old patterns. This time I found small borders, which I used together with the cables for this October project for Sophia. turned out beautiful on the sweater. Round the edges, I knitted a small little pattern, which worked out nicely for the sweater. The sweater is buttoned at the top back. Cast on 100 sts in brown and knit 1 row. 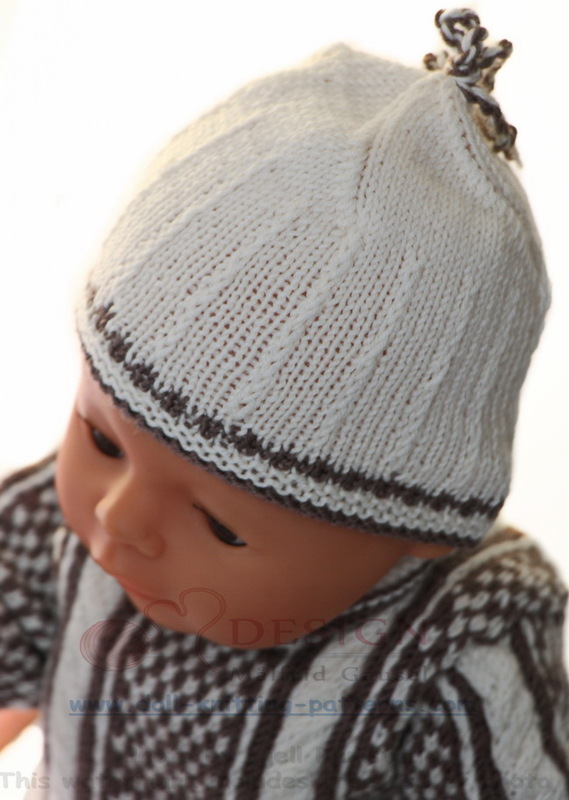 Change to white and knit 4 rows ga. Continue knitting in the round and knit pattern A. (See diagram) Change to white and knit 1 row. On next row increase 20 sts evenly on row = 120 sts in total. 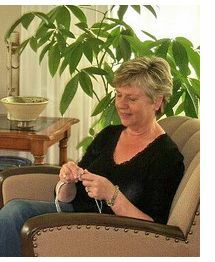 Continue knitting 2 rows st st before knitting pattern for the sweater. Place a marker at each side. Begin the first side and knit pattern until marker on the other side. Then repeat this pattern for the back. 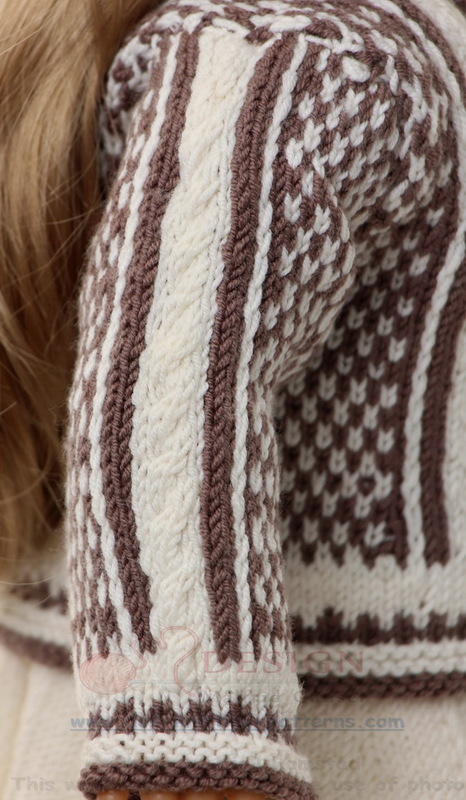 (See pattern for the sweater). Continue knitting pattern until work measures 10 cm. (See diagram). Divide work and knit back and front separately. Then I knitted an old-fashioned skirt in off-white. For cold days, I knitted her ordinary pants in off-white and it is bound up with a chord round the waist. 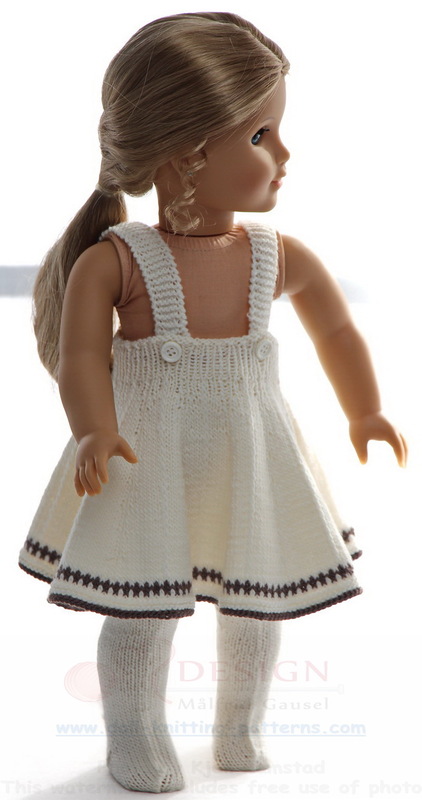 My doll is lovely in this skirt together with the sweater and cap. As this pattern for the sweater was much, I thought a cap in off-white would be nice. The cap has the border like the borders for the sweater along the edge. At the top, it has a tassel in off-white and brown. 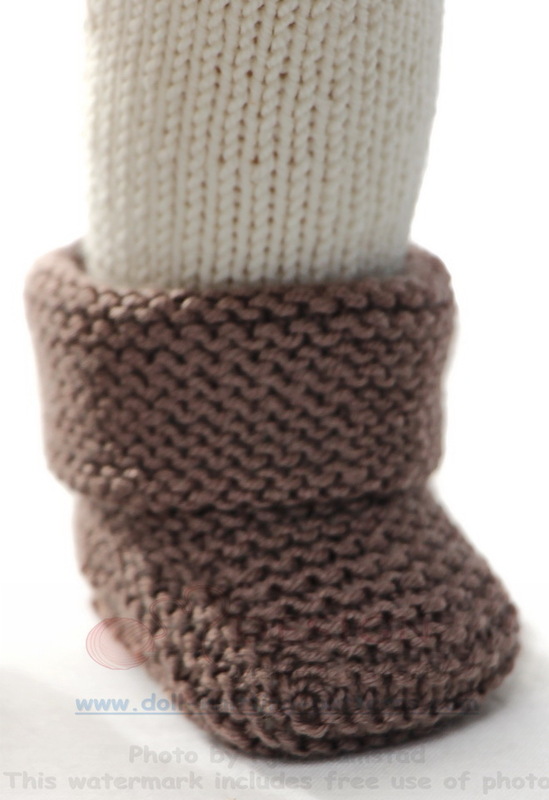 At last, I knitted a pair of warm socks/shoes for my doll Sophia. 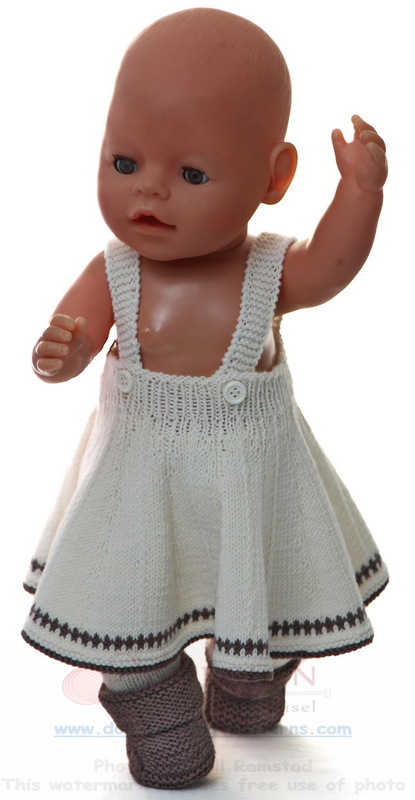 They are knitted in garter sts and look very nice on the dressed doll! I hope you too will enjoy knitting these clothes.